Went here for a quick bite for lunch with a sales. Forgot my camera, these pictures were taken by my iphone. Teriyaki Chicken, sukiyaki beef, vegetable, rice. Sukiyaki beef was so salty. Couple pieces of big yellow tail sashimi with spicy sauce, it's really good. 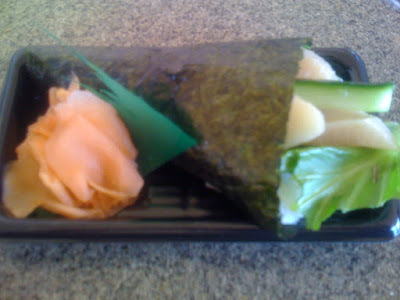 I liked this hand roll. 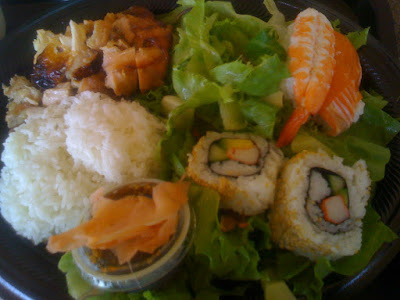 2 pieces of sushi (one salmon and one shrimp), 2 pieces of california rolls, teriyaki chicken, rice & salad, served with miso soup. They have these 3 value meal sets usually run from $6.55-$7.80 but now all $4.99 and all served with miso soup. cali roll was just ok, salad is terrible, good dressing though. 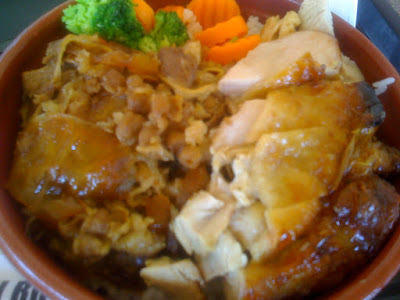 Chicken was very tender and good but the teriyaki sauce was terrible again. 2 sashimi sushi came with it were just ok. salmon wasn't really fresh enough. If wasn't for sales friend wanted to come to this place, I wouldn't even consider eating in sushiboy. really? I thought it was just OK! What's the dish I should get next time? hmm... i've ALWAYS been curious.. and now i'm not. thanks!